Magic Tree House fans: try this! 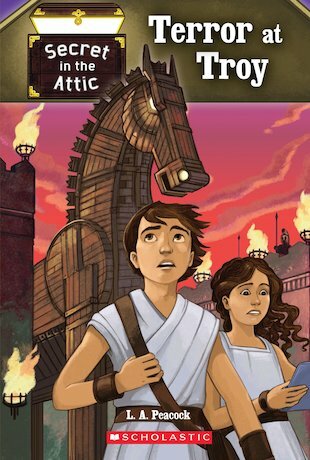 A time-travel quest set in the ancient city of Troy. Battles, heroes and rescues! A little while ago, twins Jess and Josh found a magic time-compass hidden in their attic. Now the compass has swept them back in time to the fortress city of Troy. The twins meet the warrior Achilles, who is leading the Greek army. His plan is to attack the threatened city and rescue the beautiful Helen. But just as the great battle is about to begin, the twins get word of their mysterious uncle. How can they safely enter the city to find him?